A company run by one high-dollar Hillary Clinton donor is reportedly in talks to pay $3 billion for a company run by another high-dollar Hillary Clinton donor. The Wall Street Journal reported on Tuesday that Comcast is exploring the acquisition of DreamWorks Animation in a move seen as an effort to compete with Disney in theme park and consumer products markets. The move involves two high-profile political donors, both of whom are supporting Hillary Clinton’s presidential run. 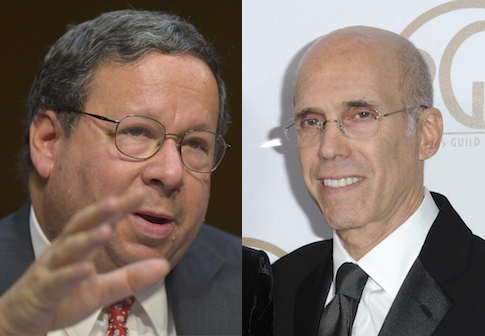 Comcast executive vice president David Cohen and DreamWorks CEO Jeffrey Katzenberg both hosted fundraisers for the former secretary of state. The Journal reported that Katzenberg would receive a near-$22 million payout if the sale goes through and he leaves the company. "DreamWorks isn’t a heavy lift" for Comcast at $3 billion, the Journal noted in a separate piece. The animation studio has lost money in four of the past five years, and Comcast is posting promising revenue numbers. DreamWorks has also been forced to deal with a rash of legal troubles in the last couple years. The Securities and Exchange Commission revealed in 2014 that DreamWorks was one of five U.S. film studios under investigation over bribery allegations in China. Neither the SEC nor the Justice Department would comment on the status of that investigation. In a SEC filing the same year, DreamWorks announced a separate investigation over a $13.5 million write-down following the disappointing release of Turbo, an animated 2013 film about talking snails. The company said in an SEC filing in February that that investigation is ongoing. This entry was posted in Politics and tagged Comcast, David L. Cohen, Democratic Donors, Jeffrey Katzenberg. Bookmark the permalink.